Detailed safeguards and specialised institutions have been developed to tackle the circumstances in which torture occurs and to establish independent public oversight of places of detention. However, torture and ill-treatment are still widespread. The Omega Research Foundation, a UK-based research organisation, looks at the importance of independent monitors to document and monitor the use of weapons and restraints in places of detention. Despite the prohibition on torture and cruel, inhuman and degrading treatment and punishment under international law, technologies with no legitimate use in prisons or by law enforcement officials (referred to as torture technologies, and including spiked batons and leg irons), continue to be manufactured, actively promoted and used in places of detention. 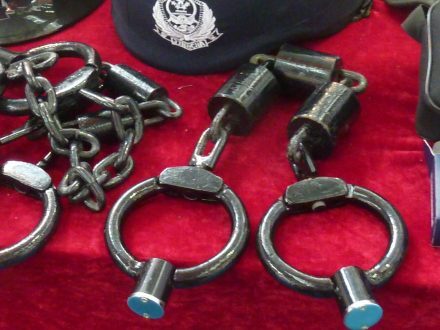 Yet it is not just ‘torture technologies’ that pose risks; indeed, reports by international, regional and national monitoring bodies have expressed concern that firearms, less lethal weapons (such as batons and projectile electric-shock weapons) and restraints (such as handcuffs) are widely misused for the purposes of torture and other forms of ill-treatment worldwide. The role of such equipment is all too easy to overlook when on monitoring visits – but it is vital for detention monitors to document this equipment and ‘make the tools visible’, for several reasons. Monitors need to be able to recognise and document equipment that has been deemed to have no use other than for torture and ill-treatment and thus has no role in places of detention. The presence of such equipment is incompatible with Article 2.1 of the Convention Against Torture, which states that ‘each State Party shall take effective legislative, administrative, judicial or other measures to prevent acts of torture in any territory under its jurisdiction’ and the Nelson Mandela Rules (Rule 47), which prohibits the ‘use of chains, irons or other instruments of restraint which are inherently degrading or painful’. This issue has also consistently been addressed by the United Nations General Assembly in the (now) bi-annual Danish-sponsored Torture resolution, most recently in 2015, which calls upon all States to ‘take appropriate effective legislative, administrative, judicial and other measures to prevent and prohibit the production, trade, export, import and use of equipment that have no practical use other than for the purpose of torture or other cruel, inhuman or degrading treatment or punishment’. Detention monitors highlighting poor practices could assist States in implementing this Resolution through documenting when such equipment is used (or otherwise found) in places of detention, and recommending its prohibition, in line with international norms and standards. Furthermore, in cases where equipment has been imported into the country in question, documenting its presence could also contribute to prohibiting the international trade in such items – the aim of the Global Alliance for Torture-Free Trade, launched recently, with 58 states signing at the General Assembly in September 2017. Other equipment can have a legitimate function, but is often misused for torture and cruel, inhuman and degrading treatment and punishment. Secondly, whilst some equipment has no use other than for torture or ill-treatment, other equipment can have a legitimate function, but is often misused for torture and cruel, inhuman and degrading treatment and punishment. The former UN Special Rapporteur on Torture (2004) noted that the ‘vast majority’ of cases seen by his office ‘have involved the misuse of those instruments, legitimate in appropriate circumstances, to inflict torture’, and considered that ‘the obligation to prevent torture in the Convention against Torture and Other Cruel, Inhuman or Degrading Treatment or Punishment necessarily includes the enactment of measures to stop the trade in instruments that can easily be used to inflict torture and ill-treatment’. He further noted the role of torture prevention monitors in examining ‘the situation of trade in instruments used for torture in the course of his/her country visits and transmit communications to Governments concerning allegations of trade in security and law enforcement technology easily used for torture’ (Special Rapporteur on Torture, 2005). Monitoring the misuse of other equipment for torture and ill-treatment potentially brings many benefits. These include being able to recognise whether the training, guidance, use and post-incident procedures are in keeping with international norms and standards, and identifying whether the equipment contains characteristics of concern, which may make its deployment more problematic, enhance the risk of injury and/or have implications for proportionality and necessity of its use. Moreover, depending on the type of equipment and the country of origin, the export may also be in breach of national or regional trade control regulations or may highlight regulatory gaps. Thirdly, independently documenting and reporting the presence and use of weapons and restraints in places of detention – and the suitability of any such equipment – can help to safeguard the independence of monitors, ensuring they are not reliant on information provided by the authorities in their enquiries. It may help monitors verify allegations of torture and ill-treatment made by detainees, if, for example, equipment alleged to have been used for torture is found on the premises, and features of the weapon or restraint match those recounted by the detainee. Documenting such weapons can add important value to monitoring implementation of the Convention Against Torture or the Nelson Mandela Rules. Further resources on how to document weapons and restraints in places of detention are available on the Omega Research Foundation website, and a forthcoming publication, Monitoring Weapons and Restraints in Places of Detention: A Practical Guide for detention monitors will be available in 2018. This post is based on a forthcoming publication, Monitoring Weapons and Restraints in Places of Detention: A Practical Guide for detention monitors funded by the Economic and Social Research Council and produced by Abi Dymond (ESRC Future Research Leader Award, grant number ES/N016564/1) and the Omega Research Foundation. The Omega Research Foundation (Omega) is an independent, UK-based research organisation. Established in 1990, they provide rigorous, objective, evidence-based research on the manufacture, trade, and use of military, security and police (MSP) equipment. Such technologies range from small arms and light weapons to large weapon systems, and from policing technologies and prison equipment to equipment used for torture, amongst others.